Pancakes are one of the oldest dishes in the history of humanity. They are loved in many countries but they are cooked in different ways. 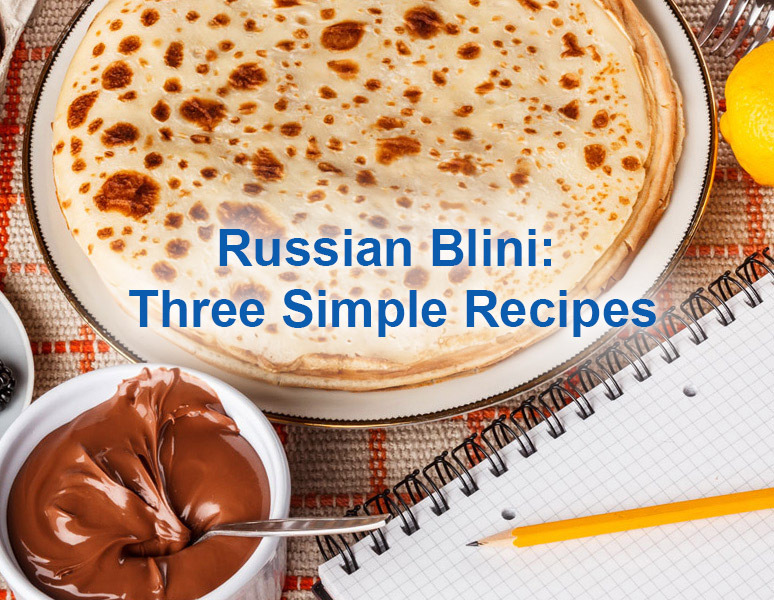 Today we are going to tell you about 3 ways of cooking real Russian Blini ( Russian pancakes ) . This is the most popular recipe for Russian pancakes. These pancakes are easy to cook, and they can be served as a dessert as well as a main dish. Finally add oil and stir all ingredients carefully. Once the pancake is ready put it on the plate and cover with a lid. You can use any filling with this type of pancakes. You can spread some jam and have a wonderful dessert for your tea; or wrap some fried minced meat and have a delicious lunch. This type of pancake is often served with caviar and red fish. You will like this way of making pancakes if there is no milk left in your fridge, or if you would like to cook a light healthy dish. You make the dough almost the same way as milk dough. The dough for healthy pancakes is ready. The way of cooking is similar to the way we make the milk dough pancakes. This type of pancake is really good as a snack or dessert. Water dough pancakes are low on calories and they can be eaten with fresh fruit and berries. 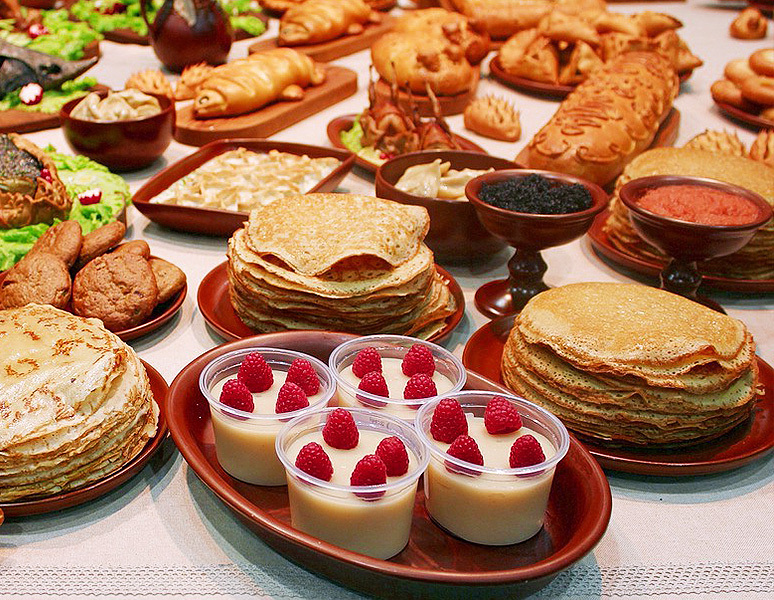 These are traditional pancakes which Russians make at Maslennitsa. They are thicker, more beaten and go well with various sweet fillings. Stir the dough again to let the air out of it and let it lift again. When the dough lifts again, you should not stir it, as you need to keep it airy, so be very careful with the dough. 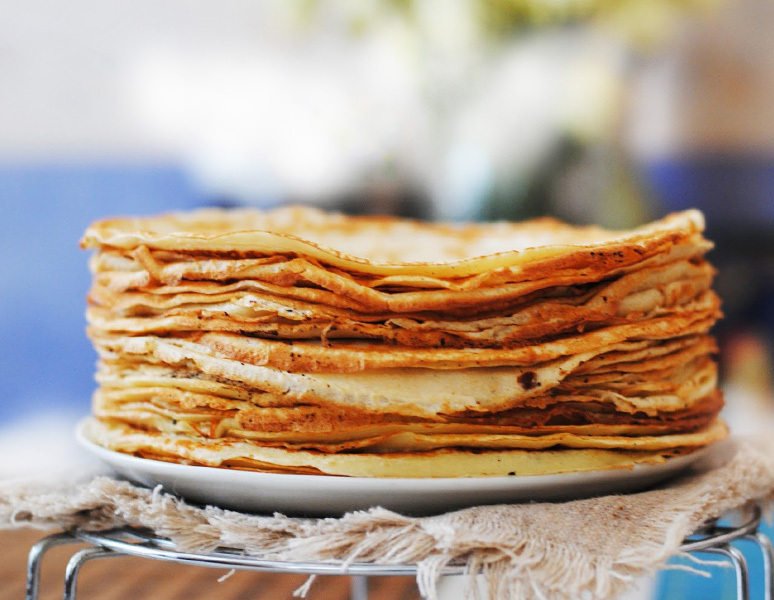 Once the pancakes are ready stack them on top of one another putting some butter on the top of every cake. Yeasted dough pancakes are ready! We recommend to eat them with sweet fillings: jam, fruit and berries. What can you eat Russian pancakes with? Pancakes are a very variable dish in Russian cuisine. There are a lot of fillings both sweet and savoury to stuff pancakes with. 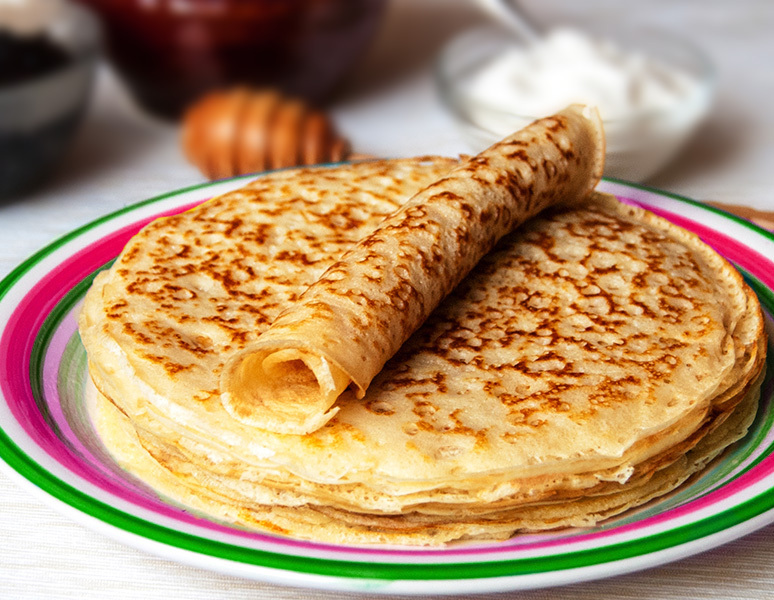 Therefore Russian pancakes can be a main course as well as a dessert. Beef and fowl are often used as a meat filling for pancakes. You can use both boiled meat and fried mince meat which goes well with mushrooms. Traditionally this type of pancake is served with sour cream which makes the pancakes less dry. You can also wrap cottage cheese with prunes or berries, for example blueberries in pancakes to get a delicious and nourishing breakfast. Jam, fruit and berries are traditionally served with pancakes. Modern recipes recommend to wrap pieces of banana in pancakes and serve them covered with hot chocolate. You can enjoy it with a cup of tea. Pancake snacks are also popular. Pancakes with red and black caviar are traditional snack for vodka. Pancakes can also be stuffed with salmon. These are classical examples of fillings. Don’t be afraid to experiment and invent your own dishes! 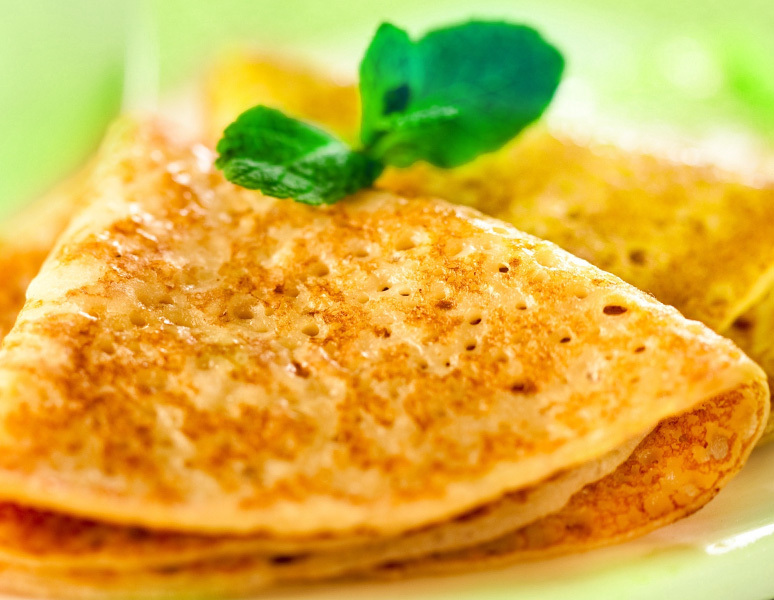 We hope you will like our recipes for Russian pancakes. Cook, try and leave your comments about Russian pancakes! I’ve been wanting to try Russian pancakes. Thank you for the recipe in English. I will try to cook! I tried to eat pancakes in your recipe with roasted vegetables. It was very unusual and new way. Later I will try new toppings. Thanks!